Posted October 10, 2014 by Heather Michet & filed under Food, Recipes. Fall is an invitation to slow down, go within ourselves and rest a bit more as we head toward winter. The call to calm and quiet is a welcome invitation after the flurry of summer energy. One way to reduce your number of activities and busy-ness is to let someone else do the cooking! Get your slow-cookers busy while you go back to the couch with a good book. Baked apples are one of my favorite fall and winter delights. Not only do I love eating fresh, local, unsprayed & unwaxed apples, I really love putting a few of them into the slow cooker and forgetting about them until they’re ready to enjoy. I think you’ll love them too. Peel one inch of peeling off the top of each apple. Place apples in slow cooker. Fill centers with fruit and nuts if using. 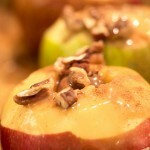 Combine remaining ingredients and pour over apples, especially centers and peeled areas. Cover and cook 2-4 hours on high or until apples are tender. If you want to get really decadent, top with a bit of milk (your choice) or cream. Gather ’round the fire, pull the blanket around you and dive in. Isn’t fall wonderful?